"Innovation for us does not mean new technologies or widgets. Rather, it represents new ways of thinking and doing business based on diverse experiences and ideas. This process only works when we bring new voices to the table, and one of the best ways to do that is by working with young innovators who have experienced a challenge and built a solution from their own experience." 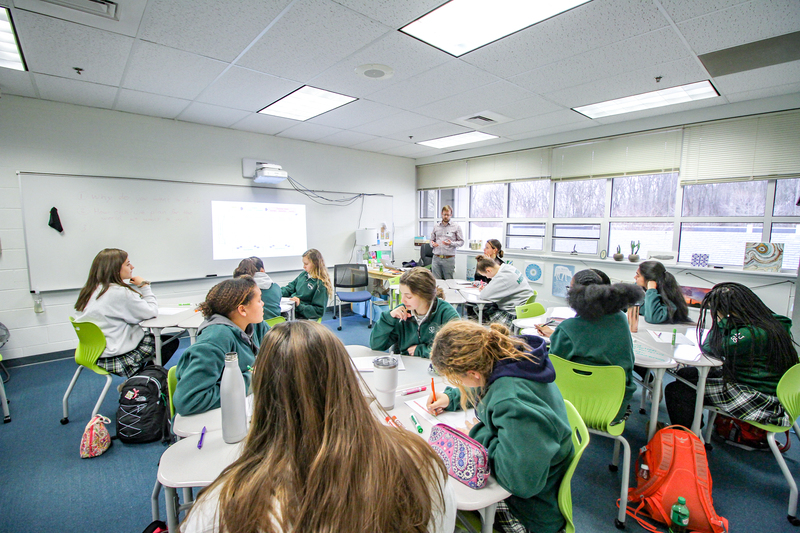 These are the sentiments shared by Alex Riehm, Director of Johns Hopkins University's Social Innovation Lab (SIL), after a visit to St. Paul's School for Girls earlier this spring. Students in the Class of 2020 SPIRITUS Scholars cohort embarked upon a unique partnership with the Social Innovation Lab. Similar to the mission of SPIRITUS Scholars, which enables juniors and seniors to develop their own research and solutions to solve a problem about which they are passionate, the SIL supports innovative nonprofits, mission-driven companies, and disruptive technologies that aim to create change and opportunity in the Baltimore community and beyond. It works with entrepreneurs and changemakers to provide the funding, mentorship, office space, and workshops needed to develop thriving, sustainable ventures that make a measurable impact. Riehm recently visited campus to kick off a partnership with the junior cohort of Scholars in their Research Methodology course. As the SPIRITUS Scholars program aims to support and challenge each Scholar to make her own "measurable impacts," SPSG was thrilled that he was willing and excited to begin working with the students. 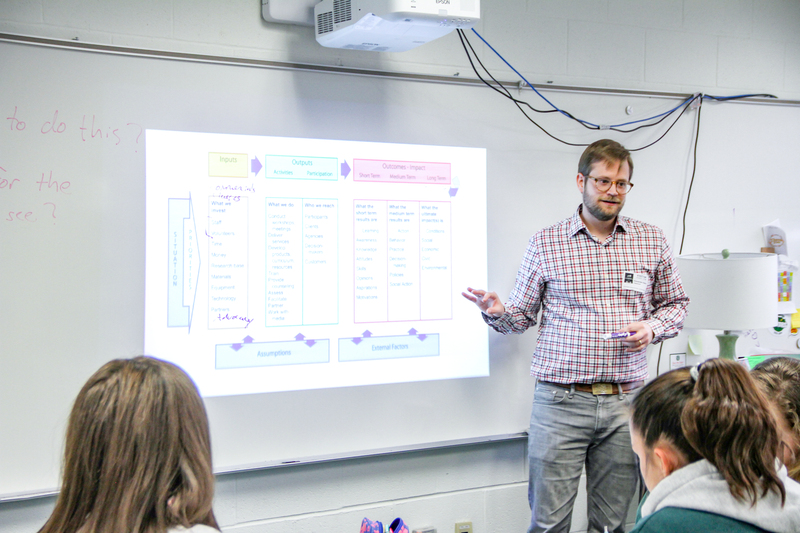 His recent visit, or "mini boot-camp," was an inspiring deep dive that introduced the Scholars to the process of creatively developing feasible outcomes and impacts. The students were tasked with imagining a superhero that reflects their individual project, in addition to crafting future newspaper headlines that reflect their end goal and impact. Riehm posed a central question: "How can we plan for the world we want to see?" "I really enjoyed Mr. Riehm's visit," shared Caroline Lee '20. "He got us to think about our projects and the impact we want to make with a different perspective. Drawing a superhero to represent our project was an original way of thinking, and it gave us a visual that we can refer to later. This seemingly simple activity allowed me to approach the problem differently and begin imagining new solutions." Nia Lewis '20 is just beginning her research on the exploitation of certain groups of women for their hair, and she is hoping to create a safer, less costly, and more accessible synthetic hair alternative to create wigs and weaves in the future. "Prior to Mr. Riehm's visit, I was unsure about the impact I wanted to make with my Scholars project," shared Lewis. "During the time that he spent with our class, I gained valuable information that I plan to utilize within my project such as the importance of assumptions and external factors." The afternoon class was a mutual learning experience for both the Scholars and Riehm. "Juniors, and the seniors who visited the class, were each responding to challenges they have seen in their communities, and hearing these perspectives helps me learn more about the challenges our shared community faces," he shared. "In addition, unleashing our creativity reminded me how important it is to stretch this muscle frequently. They came up with amazing ideas in such a short time!" The SPIRITUS Scholars are already looking forward to future partnership with Riehm and the Social Innovation Lab. On April 30, members of the junior cohort will attend SIL's Innovation & Impact Forum 2019 to hear from social innovators as they share stories behind their work tackling challenges in the areas of health, education, and community development in Baltimore, much like the work each Scholar is pursuing. To learn more about SPIRITUS Scholars, click here.